When the Dual Intensity Eyeshadow Palette from NARS started appearing on the web it was love at first sight: I had tried the single Dual Intensity Eyeshadows and loved them but never actually bought one. I wasn’t even sure it was going to come out here though: we don’t get everything and the timings are often a bit strange. But then one day I walked into Sephora and I saw it: guess what? It was the last one! It always happens: I grab the last LE thing, especially with Chanel, but often with NARS too. I must be makeup lucky! The packaging is on the thicker side for NARS, but I guess is his new style: squarer and “bulkier” shapes, but still beautiful. The mirrored lid is to die for (check out the amazing pictures in Jaa’s post here! ), and the included brush works really well. These eyeshadows have an unique texture, that reminds me a bit of the Extra Dimension products from MAC, but better: I feel like they’ve waited until they made them perfect! When you go to pick the product with a brush the first impression is of a drier and harder eyeshadow, but the result is high pigment and absolutely no fallout. The payoff when using them wet is incredible, but it’s not weak when using them dry. They’re incredibly blendable and a breeze to apply: they’re perfect! It you’ve been thinking about getting this palette, get it. It’s absolutely worth it. It’s really versatile, and totally unique. I’d go as far as saying it’s become my absolute favourite palette! 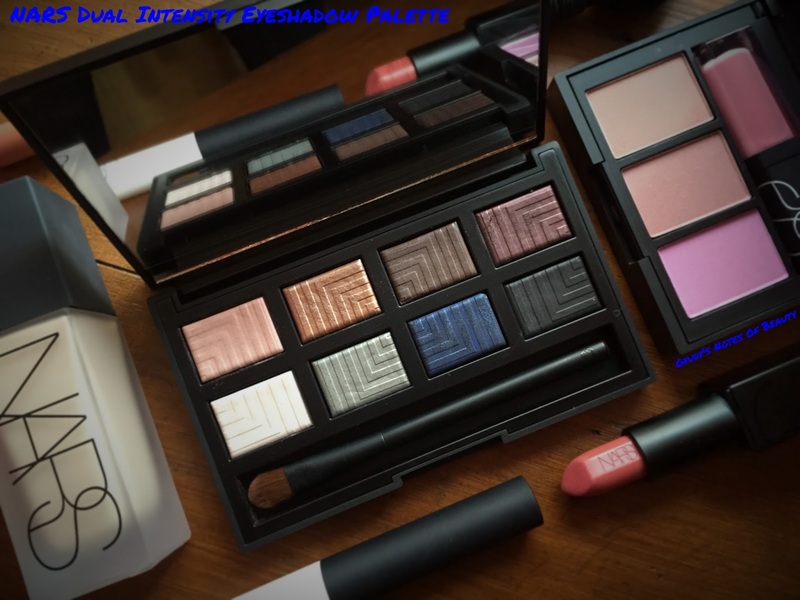 Have you tried this palette or the single Dual Intensity Eyeshadows from NARS? Are you a big NARS lover too? Quando la palette NARS Dual Intensity Eyeshadow Palette ha iniziato ad apparire in giro per il web, è stato amore a prima vista: avevo provato gli ombretti singoli Dual Intensity ma non ne avevo mai acquistato uno. Non ero nemmeno sicura che questa palette sarebbe uscita anche qui però: non esce tutto e spesso le tempistiche sono un po’ strane. 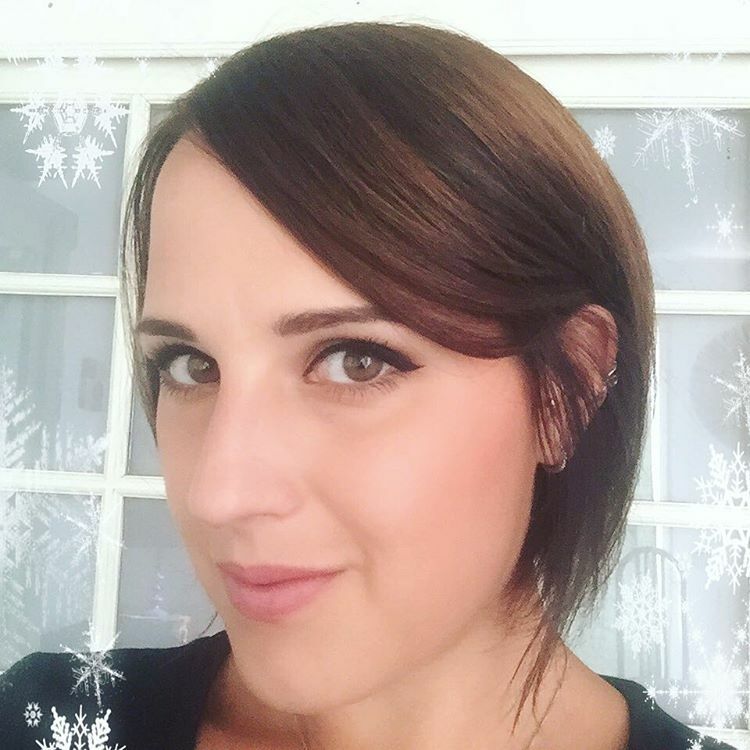 Ma un giorno, entrando da Sephora, l’ho vista: indovinate? Era l’ultima! Succede sempre: riesco a prendere l’ultimo pezzo disponibile di un’edizione limitata, specialmente per quanto riguarda Chanel, ma spesso anche NARS. Che fortuna! Il packaging è più spesso del classico NARS, ma credo che sia il suo nuovo stile: forme più squadrate e “ingombranti”, ma comunque bellissime. Il coperchio a specchio è spettacolare (andate a vedere le bellissime foto nel post di Jaa! ), e il pennello incluso mi piace molto. Questi ombretti hanno una texture unica, che mi ricorda un po’ quella dei prodotti MAC Extra Dimension, ma ancora migliorata: è come se NARS avesse aspettato di trovare la texture perfetta! Quando si prende il prodotto con il pennello si ha l’impressione di un ombretto più duro e asciutto, ma il risultato è una pigmentazione eccezionale e assolutamente nessun residuo polveroso. L’impatto se usati bagnati è assolutamente incredibile, ma non vuol dire che sia debole quando usati asciutti. Si sfumano benissimo e si applicano con estrema facilità: sono perfetti! Se stavate pensando se prendere o no questa palette, fatelo. Ne vale davvero la pena. È perfettamente versatile, e davvero unica. Mi spingerei addirittura a dire che è diventata la mia palette preferita! 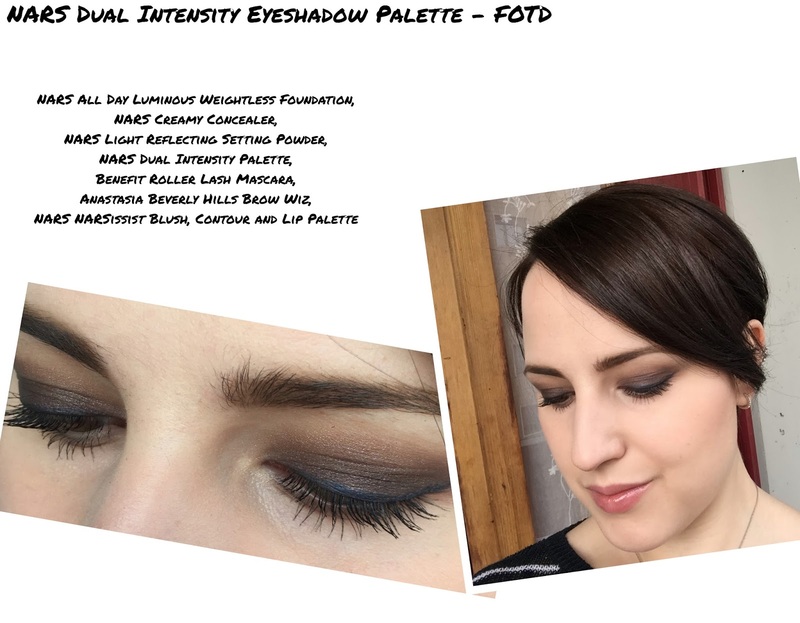 Avete provato questa palette o gli ombretti Dual Intensity? Siete anche voi amanti dei prodotti NARS? *sigh* Such an amazing palette! I love the look you did. WOW!! This looks absolutely stunning and I love the eye makeup you chose to apply in that picture. The blue right above your lashes looks beautiful! I have resisted this palette for ages now, but it looks so beautiful! I need it! :o Really love the look of the plum and navy shades. Hey Guydy, I love the look you made with the palette! I do like it, but I don't think I'll use the bottom row often. I might grab a couple of single eyeshadows at some point tho! The colors look stunning on you. The shadows look buttery soft and smooth. I'm not much for palettes, but this one looks as if all the colors are usable. What a wonderful feeling it is to be the person that picks up the last product on the display. It is as if you are getting something special that no one else has--doesn't happen to me too often--you are makeup lucky. HUBBA BUBBA MAMMA IN TRUBBA. I've seen this at Sephora and I've swatched a few of the shades, but it's $90 here, and I'm not convinced I need it as realistically, I probably won't touch the colourful shades. I'm thinking of buying one of the singles, but I love the look you've created! I love how rich and warm it looks on your eyes. It is beautiful. I am one of those people who have been avoiding Nars for its hype. I don't hate them but I have not bought anything from Nars yet. I believe your opinion though.